Those of us who love motorcycles and small engine vehicles would love to have a job as a motorcycle mechanic. If you like to work with your hands, building and installing engines, repairing and service bikes and other small vehicles, then you have come to the right place. Motorcycle mechanics can work at dealerships, garages, and repair shops, there’s something for everyone in this line of work. 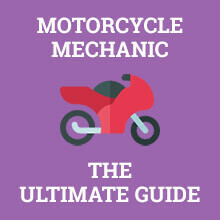 Let’s put the pedal to the metal and find out how to become a motorcycle mechanic. What is a Motorcycle Mechanic? Motorcycle mechanics specialize in the inner workings of motorcycles and other small engines. On a daily basis, you’ll be asked to repair, diagnose, replace and maintain motorcycles. You may also be asked to work on the frame of the motorcycle, hammering out dents, and even work on the computer systems within the motorcycle’s motherboard. Some motorcycle mechanics work in body shops, while others work at dealerships. It is possible to own your own repair shop with training and experience. The average salary for a motorcycle mechanic in the US is around $33,000, but can be as low as $27,000, and as high as nearly $44,000. All of this depends on the education that you have, the experience you have, and where you work. If you find a job in a highly populated area, you’ll have more success as a motorcycle mechanic as well. In order to be a motorcycle mechanic, you need a high school diploma, or a GED. This will get you a decent training position, but if you really want to sell yourself, you’ll need to enroll in a motorcycle mechanic training program. You can find these at technical colleges, or even community colleges around the country. If you want to run your own shop one day, you’ll need to get an associates degree in business or management. Hands on experience and training will provide you with the tools needed for this job. This is where you’ll want to step up your game, and get training in areas like microcomputers, motorcycle maintenance (of course), suspensions and engines. The better educated you are on the inner workings of a motorcycle, the easier it will be to become employed. Disassemble, assemble, install and repair engines and other large pieces of the motorcycle. Inspect the inner workings, as well as the computer parts. Use electronic testing equipment to diagnose issues. Depending on the state you live in, you may have to get certified in motorcycle mechanics, and you may even have to pass a state exam. To find out if this is the case for you, check out your states licensing board. These programs may take between 12 and 18 months. Most programs require that you do an internship as well as the coursework. Now that you’ve got all that education under your belt, it’s time to work in the field. Getting the experience will provide you with hands on education that all employers want. The more experience you have, the better chance you’ll get promoted, so keep pushing yourself to learn more and learn the new techniques that become available. 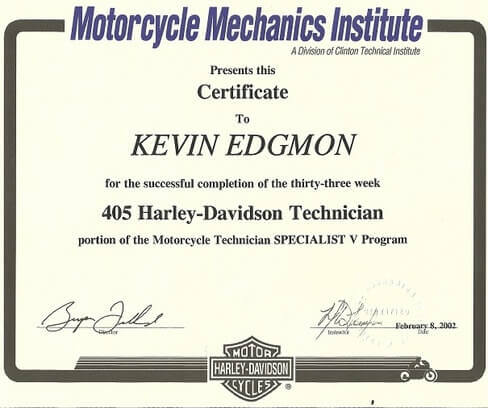 For most motorcycle mechanics, a certificate is the perfect post secondary education. Though, some decide to get an associates degree at a trade school or a community college. Those who get an associates degree also learn about business and management, which can help if you want to open your own shop one day. Whether you get a certificate or obtain a degree, you’ll need at least 1-2 years of on the job training to be considered for employment. Some training programs may require you to do an internship along with the program, so check out local shops to see if you can work alongside a senior mechanic. A certificate in motorcycle maintenance is not required in every state, but you’ll want to check your state requirements before you start applying for jobs. The certificate from the Equipment and Engine Training Counsel is the recognized credential for motorcycle maintenance today. If you want to show that you are competent in this profession, getting that certificate can help a lot. There are several motorcycle manufacturers, such as Harley Davidson, Honda, BMW, and more, that provide certificate programs to their employees. In order to get certified, you’ll want to study topics like electrical systems, exhaust, maintenance, etc. It can take between 6 months and two years to obtain the education needed, but on the job training should last a lifetime. The expected growth for a motorcycle mechanic is around 5 percent in the next ten years. This is not a fast-growing career plan, but it is important none the less, as there are plenty of motorcycle riders around, and they need to be kept safe. California and Texas have the most motorcycle mechanics than any other state. The number of motorcycle mechanics needed is expected to increase slightly throughout the next year. That's a higher than average projected growth of 100 jobs. Should You Become a Motorcycle Mechanic? The overall job satisfaction for a motorcycle mechanic was about 68%. There are long hours and a lot of training. Those that stuck it out and gained experience had a good chance of getting promoted. Owning your own shop increased satisfaction. The average salary for a motorcycle mechanic is $33,000. Those that work in states in Hawaii and Alaska made more than $50,000 a year. If you own your own shop, or work for a large motorcycle manufacturer, you will typically make more money. If you have a lot of experience, you’ll also make quite a bit more money than someone just starting out in the field. The job growth outlook isn’t as much as some other mechanic careers, but this type of mechanic is still necessary in the United States. If you want to boost your chances of getting a higher paying position, you’ll want to move to a state that has the most opportunities. Since the certificate is optional in most states, education can last from 6 months to two years. If you get an associates degree, your education time will be longer, but you’ll have more skills and have a better chance of getting that promotion you’lve been waiting for. Q. How much does a motorcycle mechanic make? Starting out, motorcycle mechanics make around $27,000 a year, but as you get more experience, you can make nearly $44,000. Q. How do you become a certified motorcycle mechanic? Find out what the laws are in your state, depending on the state, a certificate in motorcycle mechanics may be necessary. If so, you’ll want to contact the Equipment and Engine Training Counsel to find a testing site near you. Q. How long does it take to become a motorcycle mechanic? As little as six months, but if you get your associates degree, it’ll take around 2 years. But training should last a lifetime. Q. What does a motorcycle mechanic do? A motorcycle mechanic works on small engines, checks conditions of tires, examines the frames of motorcycles and other small vehicles, and repairs issues with vehicles. Q. What is the demand for motorcycle mechanics? Though the rate of employment is slower for these specific mechanics, the ones with more education and training have a better job outlook.